Presidential candidate of the Peoples Democratic Party (PDP), Atiku Abubakar on Wednesday afternoon met with prominent Igbo leaders from the five states of the South East. Atiku addressed the gathering in company of his running mate, Peter Obi, at the meeting held at Nike Lake Hotel, Enugu. 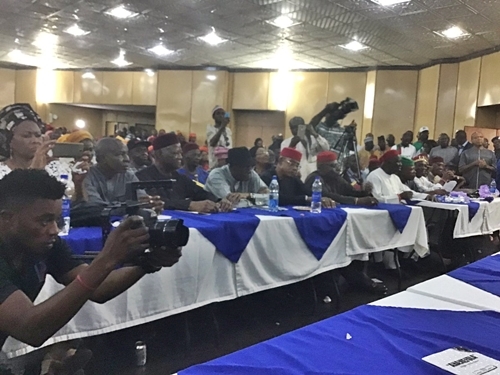 President General of Ohanaeze Ndigbo, Chief Nnia Nwodo and the Obi of Onitsha, Igwe Nnaemeka Achebe, joined the meeting midway. Those in attendance were, Senator Ben Bruce, Ben Obi, Prof. Ben Nwabueze, Senator Chris Anyanwu, Chief Achike Udenwa, Chief Onyema Ugochukwu, Prof. Anya O. Anya, Emeka Ugwu-Oji, Amb. Frank Ogbuewu, Amb. Lawrence Nwuruku, Senator Enyinnaya Abaribe, Prof. A.B.C. Nwosu, Prof. Uche Azikwe, Amb. George Obiozor and former Ohanaeze President-General, Chief Gary Igariwey. Others included, Lt.Gen. Azubuike Ihejirika (rtd), Olisa Agbakoba (SAN), Prof. Osita Ogbu, Dr. Okwesileze Nwodo, Chief Felix Mgbada, Archbishop Maxwell Anikwenwa, Prof Walter Ofornagoro, Commodore James Anieke (rtd), Chief Abel Chukwu, Prof Amuche Azi, Prof. Uzodimma Nwala, Amb. Lawrence Agubuzo, Chief Adolphus Wabara, among others. 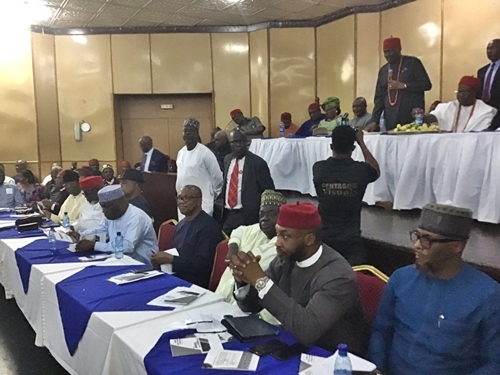 The meeting, chaired by renowned constitutional lawyer, Nwabueze, has restructuring of Nigeria and the agenda for the Igbo in 2019 as its main thrust.